Technically Dryden gets its origins in 1915, but it did not become a part of NASA until 1958 when NASA was formed. DFRC is located inside Edwards Air Force Base, and was named in honor of the late Hugh L. Dryden in 1978. Dryden himself was an aeronautical engineer, and was NASA’s deputy administrator until his death in 1965. DFRC has been called the National Advisory Committee for Aeronautics Muroc Flight Test Unit, the High-Speed Flight Research Station (1949), and the High-Speed Flight Station (1954). Dryden is NASA’s premier site for aeronautical research and operates some of the most advanced aircraft in the world including the modified Boeing 747 known as the Shuttle Carrier Aircraft (SCA) which was designed to carry a Space Shuttle orbiter back to Kennedy Space Center (KSC) if one landed at Edwards. The Lunar Landing Research Vehicle or LLRV was an Apollo Project era program at Dryden that built a simulator for the Moon landing. The LLRVs were used to study and analyze piloting techniques needed to fly and land the Apollo Lunar Module in the moon’s airless environment. Today, Dryden manages the launch abort systems testing and integration, in partnership with the JSC and Lockheed Martin, for the Space Shuttle’s future replacement. 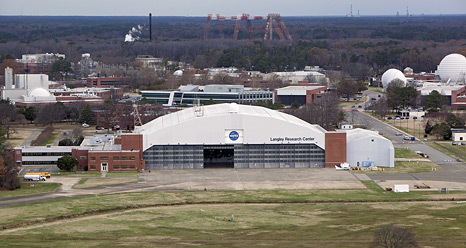 Langley Research Center (as well as Langley Field and the Langley Laboratory) are named for aviation pioneer Samuel Pierpont Langley. Established in 1917 by NASA’s predecessor, the National Advisory Committee for Aeronautics (NACA), LaRC currently devotes two-thirds of its programs to aeronautics, and the rest to space. During Project Mercury between 1958 and 1963, LaRC served as the main office of the Space Task Group, which was eventually transferred in 1963 to the Manned Spacecraft Center (now the Lyndon B. Johnson Space Center) in Houston, Texas. Langley pioneered many firsts in space, including the Lunar Landing Facility providing the simulation of lunar gravity which opened in 1965. Since the start of Project Gemini, the Lunar Landing Research Facility simulated moon landings and included a mock Apollo Lunar Module suspended from a gantry over a simulated lunar landscape, as well a work on some Lunar Landing Research Vehicles (LLRV). Langley also pioneered the Viking program for Mars exploration, and supported NASA’s mission by designing a spacecraft for a Mars landing. 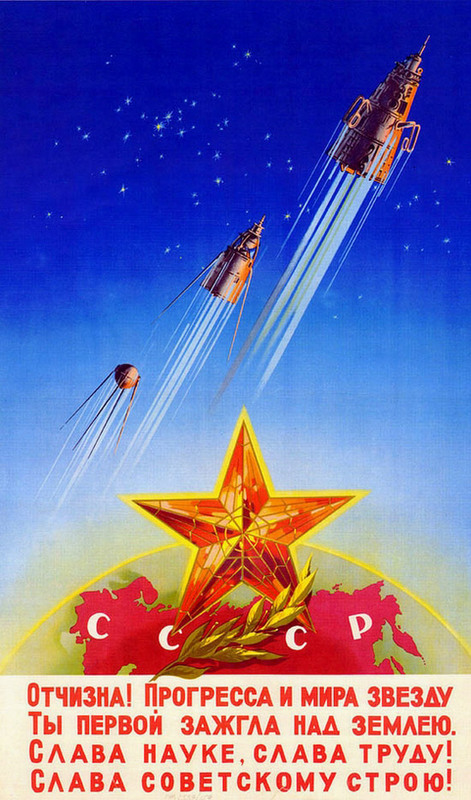 A post about global space operations would be incomplete without talking about what the Soviet space program pioneered. This poster was borrowed from a Russian travel blog located here: Russia Travel Blog | All About Russia in English. Please let me know if I should take this reference down and have borrowed it against some sort of copyright. The Soviet space program is composed of the rocketry and space exploration programs conducted by the U.S.S.R. (Union of Soviet Socialist Republics), also known as the Soviet Union, which was dissolved with the fall of the Soviet Union in 1991. This program is responsible for the first intercontinental ballistic missile (the R-7 Semyorka, 1957), first satellite (Sputnik-1, 1957), first animal in space (the dog Laika on Sputnik 2, 1957), first human in space and Earth orbit (cosmonaut Yuri Gagarin on Vostok 1), first woman in space and Earth orbit (cosmonaut Valentina Tereshkova on Vostok 6 in 1963), first spacewalk (cosmonaut Alexey Leonov on Voskhod 2), first Moon impact (Luna 2), first image of the far side of the moon (Luna 3) and unmanned lunar soft landing (Luna 9), first space rover, first space station, and first interplanetary probe (yes I totally yoinked that list from Wikipedia plus a few edits of my own, but it’s true! A bunch of other firsts and tidbits are out there if you’re interested). Although the Soviet space program is listed as starting in the 30’s with their rocketry accomplishments, the first well known accomplishment of the Soviet space program was the launch of the world’s first satellite, Sputnik1, on the on 4th of October, 1957. 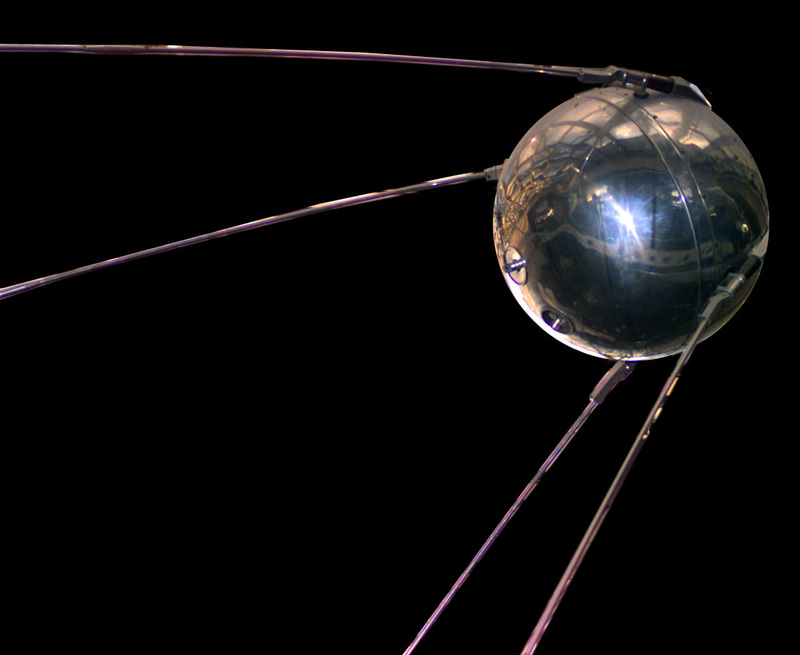 Sputnik was launched from the Baikonur Cosmodrome in Kazakhstan, and obtained data through the propagation of radio signals in the ionosphere. Telemetry included data on temperatures inside and on the surface of the sphere, and the density of the upper atmosphere could be deduced from its drag on the orbit. Another famous Soviet accomplishment was the space station Mir, but it was not the first. The first space station was the Soviet’s Salyut1 in 1971. 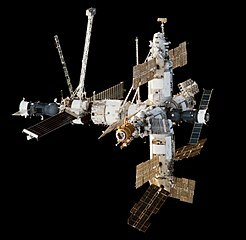 Mir actually operated in low Earth orbit from 1986 to 2001, at first by the Soviet Union and then by Russia. Although the vast majority of the station’s crew were Soviet or Russian, the station was also made accessible to astronauts from North America, several European nations and Japan. 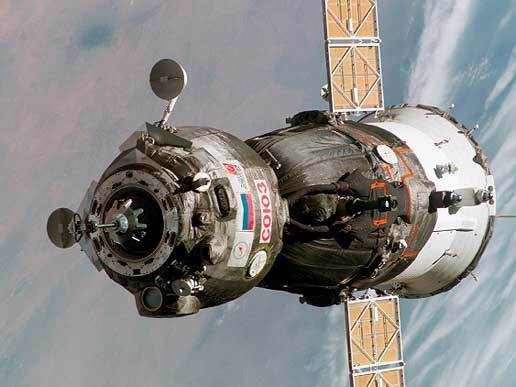 Mir was serviced by Soyuz spacecraft, Progress spacecraft and U.S. space shuttles, and was visited by astronauts and cosmonauts from 12 different nations. The station was the first consistently inhabited long-term research station in space, and held the record for the longest uninterrupted human presence in space until 23 October 2010 when the International Space Station (ISS) surpassed it. Mir still holds the record for the longest single human spaceflight, 437 days 18 hours by Valeri Polyakov. Mir’s power was provided by several photovoltaic arrays mounted directly on the modules, and it maintained an altitude between 184mi (296 km) and 262 mi (421 km). Mir traveled at an average speed of 27,700 km/h (17,200 mph), completing 15.7 orbits per day. The Jet Propulsion Laboratory (JPL) is located in Pasadena, California, and is managed by the California Institute of Technology (Caltech). Construction and operation of robotic planetary spacecraft as well as unmanned planetary missions are managed by JPL, while Goddard manages unmanned earth observation missions and observatories in Earth orbit. JPL is also responsible for operating NASA’s Deep Space Network, and has its very own mission control center. 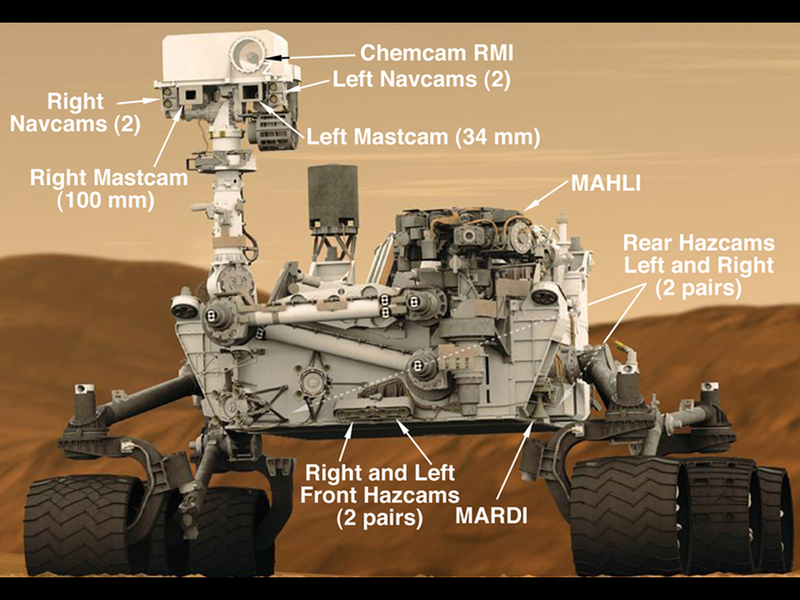 JPL is responsible for the currently well known Mars Curiosity mission, part of the Mars Science Laboratory mission. The Mars Science Laboratory mission also includes the Cassini–Huygens mission orbiting Saturn, the Mars Exploration Rovers (Spirit and Opportunity), the Mars Reconnaissance Orbiter, the Dawn mission to the dwarf planet Ceres and asteroid Vesta, the Juno spacecraft to Jupiter, the Gravity Recovery and Interior Laboratory (GRAIL) mission to the Moon, the Nuclear Spectroscopic Telescope Array (NuSTAR) X-ray telescope, and the Spitzer Space Telescope. The Ames Research Center is located at Moffett Field, California, and was selected as America’s second aeronautical research laboratory in December 1939. Ames became part of the National Aeronautics and Space Administration (NASA) when NASA was formed in 1958. Ames research focuses on gravity’s effects on living things, celestial bodies, planets and life in the universe. 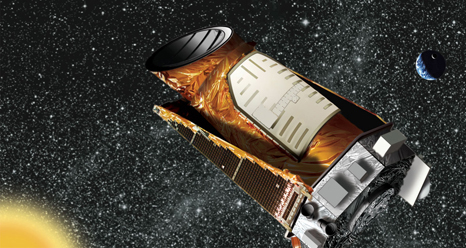 It is the lead center for the Kepler mission (pictured here), whose purpose is to find habitable Earth-sized planets outside of our solar system. The Ames center participates in biosciences, bioengineering, radiation and space biotechnology, earth science, airborne science, biosphere science, atmosphere science, astrophysics, planetary systems and exobiology. 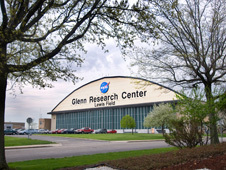 The John H. Glenn Research Center (GRC) was established in 1942 as part of NASA’s precursor, the National Advisory Committee for Aeronautics (NACA), and is located at Lewis Field in Cleveland, Ohio between Cleveland Hopkins International Airport and the Cleveland Metroparks’s Rocky River Reservation. GRC’s primary objective is to research, design, develop and test innovative technology for aeronautics and spaceflight. The Glenn Telescience Support Center (TSC) provides 24-7 Operations Support for Space Experiments on the International Space Station (ISS). GRC was called the Aircraft Engine Research Laboratory when it was conceptualized and funded in June 1940, was renamed the Flight Propulsion Research Laboratory in 1947, the Lewis Flight Propulsion Laboratory in 1948 (after George W. Lewis (head of NACA from 1919 to 1947)) and the NASA Lewis Research Center in 1958. On March 1, 1999, it was renamed the NASA John H. Glenn Research Center at Lewis Field after American fighter pilot, astronaut and politician John Glenn. John H. Glenn was original from Ohio, and was the first American to orbit Earth when he piloted “Friendship 7” around the globe three times in 1962. Because of the overlap of the pieces of Japan’s space program, I decided to include everything together here. JAXA (Japan Aerospace Exploration Agency) was formed on 1 October 2003 as a merger of three organizations: the Institute of Space and Astronautical Science (ISAS), the National Aerospace Laboratory of Japan (NAL), and National Space Development Agency of Japan (NASDA). Before the merger, ISAS was responsible for space and planetary research, while NAL was focused on aviation research. NASDA trained Japanese astronauts, developed rockets and satellites, and built the Japanese Experiment Module called Kibo, which is a part of the International Space Station (ISS). The National Aerospace Laboratory of Japan (NAL), originally known as the National Aeronautical Laboratory, was established in 1955. It assumed its present name with the addition of the Aerospace Division in 1963. NAL has pursued research on aircraft, rockets, and other aeronautical transportation systems. The Institute of Space and Aeronautical Science (ISAS) was formed in 1964, a merger between the rocket group in the Institute of Industrial Science of University of Tokyo, and the Institute of Aeronautics. ISAS is a Japanese national research organization of astrophysics using rockets, astronomical satellites and interplanetary probes, and became a division of the Japan Aerospace Exploration Agency (JAXA) in 2011. In 1970, ISAS’s L-4S-5 launched Japan’s first artificial satellite: Ōsumi. The National Space Development Agency of Japan, or NASDA, was established on October 1, 1969 under the National Space Development Agency Law. NASDA was responsible for developing satellites and launch vehicles as well as launching and tracking them, and established Tsukuba Space Center in 1972. 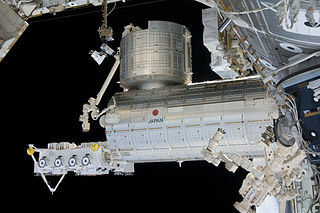 Work on the Japanese Experiment Module (JEM), called “Kibo,” at the International Space Station (ISS) was started under NASDA and was later inherited by JAXA. Kibo means Hope in Japanese, and is the largest module on the ISS. Mohri Mamoru flew under the NASDA program as first Japanese astronaut to go into space. He flew as a payload specialist aboard the Spacelab-J mission of the U.S. space shuttle in September 1992. Chiaki Mukai was the first Japanese woman in space, having flown aboard Space Shuttle Columbia in July 1994, and was the first Japanese citizen to have two spaceflights when she returned to space aboard Discovery in 1998. 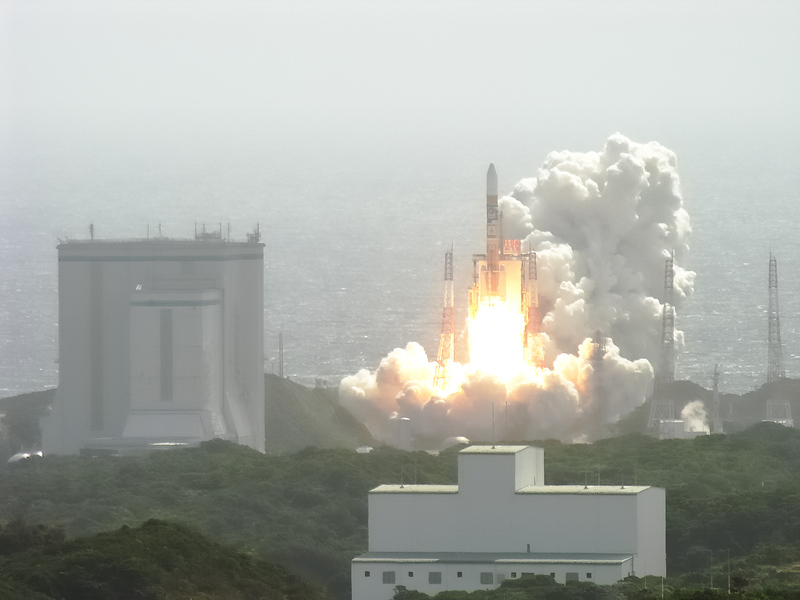 The Tanegashima Space Center (TNSC) is the largest space-development facility in Japan. HTV-1, an unmanned cargo ship, was launched on the maiden flight of the H-IIB carrier rocket from TNSC. HTV-1 was the first Japanese Space Agency (JAXA) H-II Transfer Vehicle, launched in September 2009 to resupply the ISS and support Kibo. HTV space craft, like Progress and ATV, burn up on re-entry into Earth’s atmosphere and help act as the ISS’s trash disposal. The Tsukuba Space Center (TKSC), located in Tsukuba Science City, is the operations facility for JAXA and opened in 1972. TKSC’s tourist center features models of the H-II Transfer Vehicle and a full-sized mock-up of the Kibo module. TKSC serves as the primary location for Japan’s space operations and research programs. The Japanese astronauts involved in the ISS are trained in part here in addition to the training they receive at the JSC. The base of development and operations is the Space Station Integration and Promotion Center (SSIPC – pronounced “sip-sea”), and is where the Japanese Flight Control Team is located. The astronauts onboard ISS refer to SSIPC when they want to call the Japanese flight control team. 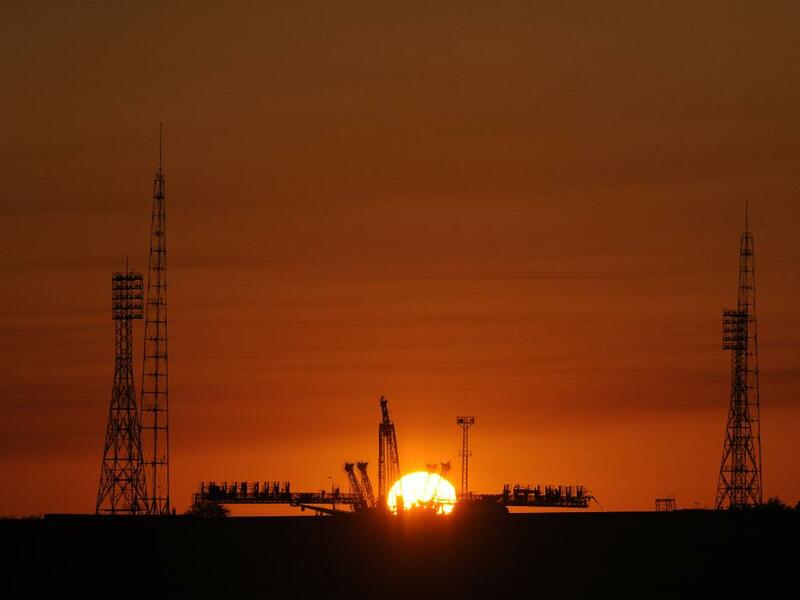 The Baikonur Cosmodrome, located in Kazakhstan, is the world’s first and largest operational space launch facility and is leased by the Kazakh government to Russia. It was originally built by the Soviet Union as the base of operations for its space program, and today is where all manned Russian spaceflights are launched. Vostok 1, the first manned spacecraft in human history, was launched from one of Baikonur’s launch pads, and is known today as “Gagarin’s Start”. This is also the location from which the world’s first intercontinental ballistic missile, the R-7 Semyorka, was tested. Right now, the Russian Soyuz is the only vehicle capable of taking people to the international space station. They also have a payload vehicle called the Progress, which helps supply the ISS (International Space Station). Both of these vehicles launch from the Baikonur Cosmodrome. Presently, the only other country with the ability to launch people into space is China. 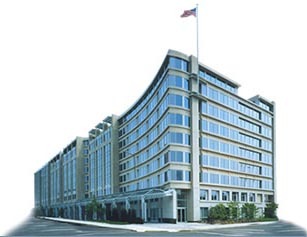 NASA headquarters is located in Washington D.C. The building pictured here is the two-building Independence Square complex at 300 E Street SW completed in 1992. 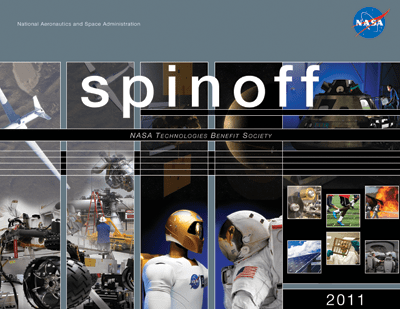 The building houses NASA’s leadership, and provides guidance and direction to NASA. NASA was established on July 29, 1958 by the National Aeronautics and Space Act, replacing the National Advisory Committee for Aeronautics (NACA). NASA became operational on October 1, 1958, and has since led a multitude of missions, including exploring the solar system, doing science in low earth orbit for the benefit of all mankind, and putting people on the moon. 1) Aeronautics: Pioneers and proves new flight technologies that improve our ability to explore and which have practical applications on Earth. 2) Human Exploration and Operations: Focuses on International Space Station operations and human exploration beyond low Earth orbit. 3) Science: Explores the Earth, moon, Mars, and beyond; charts the best route of discovery; and reaps the benefits of Earth and space exploration for society. 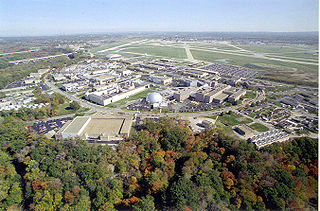 The Goddard Space Flight Center (GSFC) was established on May 1, 1959 as NASA’s first space flight center and is located in Greenbelt, Maryland. GSFC is named in recognition of Dr. Robert H. Goddard (1882–1945), the pioneer of modern rocket propulsion in the United States, and was known before that as the Beltsville Space Center. Goddard manages unmanned earth observation missions and observatories in Earth orbit, while unmanned planetary missions are managed by the Jet Propulsion Laboratory (JPL) in Pasadena, California. Goddard can develop, support, design and build the spacecraft for any unmanned mission, and is a major laboratory for developing and operating unmanned scientific spacecraft. GSFC operates the Space Network and the Near Earth Network, which are two spaceflight tracking and data acquisition networks. GSFC also develops and maintains space and Earth science data information systems, as well as satellite systems for the National Oceanic and Atmospheric Administration (NOAA). For NASA, GSFC manages many missions including the Hubble Space Telescope (HST), the Explorer program, the Discovery Program, the Earth Observing System (EOS), INTEGRAL, the Solar and Heliospheric Observatory (SOHO), the Rossi X-ray Timing Explorer (RXTE) and Swift. The Gagarin Cosmonaut Training Center (GCTC) in Star City (near Moscow) is the center for Russian space training. It was named in honor of Yuri Gagarin after his death. Yuri became the first man in space on April 12, 1961 on SV “Vostok”. 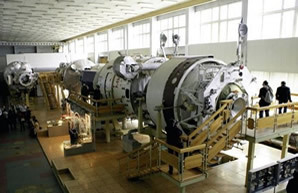 The GCTC was under supervision jointly by the Russian Defence Ministry and the Russian Space Agency Roskosmos until 2009, and is now the responsibility of their space agency. The training of cosmonauts for various space missions happens here, and GCTC includes spaceflight simulations with G-Force training and mission specific training for spacewalks called “EVAs” (Extravehicular Activity). GCTC monitors the health of its cosmonauts as they train, and helps teach them how to navigate by the stars and survive potential Soyuz failures. Soyuz is the space vehicle used to take astronauts and cosmonauts into space, and the sole transport vehicle for taking people to the International Space Station (ISS). The CCTC includes the Hydrolab, a huge pool of water similar to the NBL (neutral bouncy lab) in the United States. The Hydrolab helps train cosmonauts in the Russian space suits called the “Orlan” suits to use tools and prepares them to work outside of the space station. Different to scale mock ups of the Soyuz and space station modules are also available in various models in the GCTC to train cosmonauts on the functions and operations of instruments. 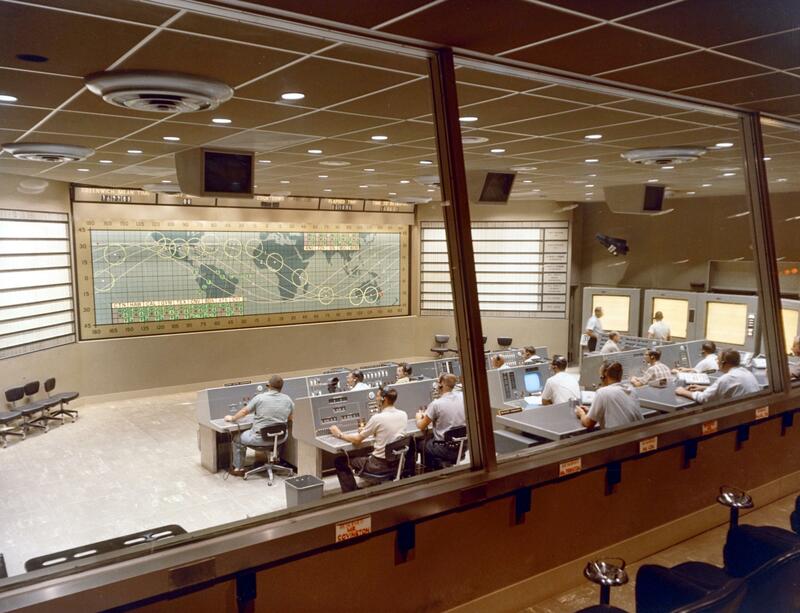 During the Mercury/Gemini days, the Mercury Control Center (later dubbed the Mission Control Center after 1963) was located in Cape Canaveral, Florida at the Cape Canaveral Air Force Station. It was located inside of a building called the Engineering Support Building, and it was at the east end of Mission Control Road. The Mercury–Redstone and Mercury-Atlas missions were all controlled here, along with the unmanned Gemini 1 and Gemini 2, and manned Gemini 3 missions. This building used to be a stop on the Kennedy Space Center tour, but was demolished in 2010 after it was estimated that it would cost $5 million to repair the facility from salt air damage and asbestos. The consoles and other artifacts of this control center, however, are still a part of the Early Space Exploration tours, at Kennedy Space Center. The John C. Stennis Space Center (SSC) is a NASA rocket testing facility that was formed in 1961, and is located in Hancock County, Mississippi. Its original name, Mississippi Test Operations, was changed to Mississippi Test Facility in 1965. In 1974, the facility was named the National Space Technology Laboratories. Finally, in May 1988, it was renamed the John C. Stennis Space Center in honor of U.S. Sen. John C. Stennis for his support of the nation’s space program. The boosters that carried our astronauts to the moon were tested here, and in June 1975, the Space Shuttle Main Engine was tested here for the first time. All the engines used to boost the Space Shuttle into low-Earth orbit were flight certified at SSC. 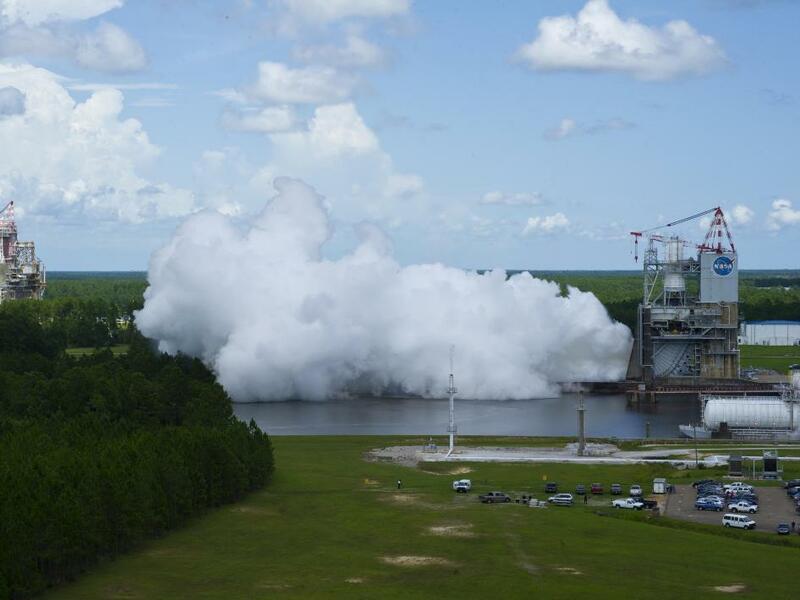 Presently, the SSC is NASA’s largest rocket engine test facility. The John F. Kennedy Space Center (KSC), located on Merritt Island, Florida, is the United States launch site that has been used for every NASA human space flight since 1968. The Kennedy Launch Control Center (LCC) would take care of NASA’s space ships until they left the hangar, when control was then handed over to Johnson Space Center (JSC) in Houston, Texas. KSC was authorized in 1958, and was originally known as the Launch Operations Directorate (LOD), reporting to the Marshall Space Flight Center (MSFC) in Huntsville, Alabama. The Vehicle Assembly Building (VAB) is the fourth-largest structure in the world by volume and was the largest when completed in 1965. Both of KSC’s launch pads are on the ocean, 3 miles (5 km) east of the VAB. The Shuttle Landing Facility at KSC was used for most Shuttle landings and is among the longest runways in the world. KSC was also home to the Merritt Island Spaceflight Tracking and Data Network station (MILA), a radio communications and spacecraft tracking complex. Despite the end of the shuttle program, KSC continues to manage and operate unmanned rocket launch facilities for the US government’s civilian space program from three pads at the adjoining Cape Canaveral Air Force Station. SpaceX’s Falcon heavy lift rocket and the Dragon all launched from here. Dragon is the first commercial vehicle to successfully dock with the ISS (International Space Station). This photo here is Johnson Space Center in Houston, Texas as seen from the International Space Station (ISS). The Lyndon B. Johnson Space Center (JSC), once known as the Manned Spacecraft Center, is NASA’s center for human spaceflight training, research, and flight control. It is home to the United States astronaut corps and is responsible for training astronauts from both the U.S. and its international partners. JSC was constructed on land donated by Rice University and opened in 1963. On February 19, 1973, the center was renamed in honor of the late U.S. president and Texas native, Lyndon B. Johnson. JSC has been the center of manned space flight operations since the beginning, playing a major role in Mercury, Gemini, Apollo, the Space Shuttle, and the International Space Station (ISS). The mission control center you usually see on TV is located here. There are actually multiple control centers at JSC, which I discuss in my sections on the different manned space flight programs throughout history. Lots of products and scientific discoveries have stemmed off of the work we do at NASA, and on average NASA returns 10 dollars for every dollar spent on her. JSC also leads NASA’s flight-related scientific and medical research programs. Technologies developed for spaceflight are now in use in many areas of medicine, energy, transportation, agriculture, communications and electronics. The Astromaterials Research and Exploration Science (ARES) office performs the physical science research, and JSC works with the National Space Biomedical Research Institute at Baylor College of Medicine to study the health risks related to long-duration space flight. Some of the benefits of that medical research include advancements in medicine for osteoporosis. You also have NASA to thank for your GPS and your cellular coverage, as well as cordless power tools and clear braces. The Launch Control Center (LCC), is a four-story building attached to the southeast corner of the Vehicle Assembly Building (VAB), and is located at KSC (Kennedy Space Center) on Merritt Island, Florida. It has been used for the supervision and control of launches since the unmanned Apollo 4 mission in 1967. Its first manned launch was Apollo 8 on December 21, 1968. Pictured here is what the LCC looked like on September 4th, 2009 after the new hurricane-rated window systems were installed in the four Firing Rooms. The four Firing Rooms inside the LCC supervise and control space vehicle launch operations all the way up until the vehicle clears the launch tower. This is where you hear the “go/no go” for launch on NASA TV. On launch day, a firing room is packed with at least 200 engineers checking the vehicle’s systems to make sure everything is ready for launch. When not being used for launch, firing rooms also monitor the health of the vehicles while they’re waiting to fly. After launch, the vehicle gets handed over to the Mission Control Center in Houston, Texas. Pictured here is what the firing room looked like during the Apollo 12 mission in November 1969. Apollo 12 was the sixth manned flight in the United States Apollo program and the second to land on the Moon four months after Apollo 11. 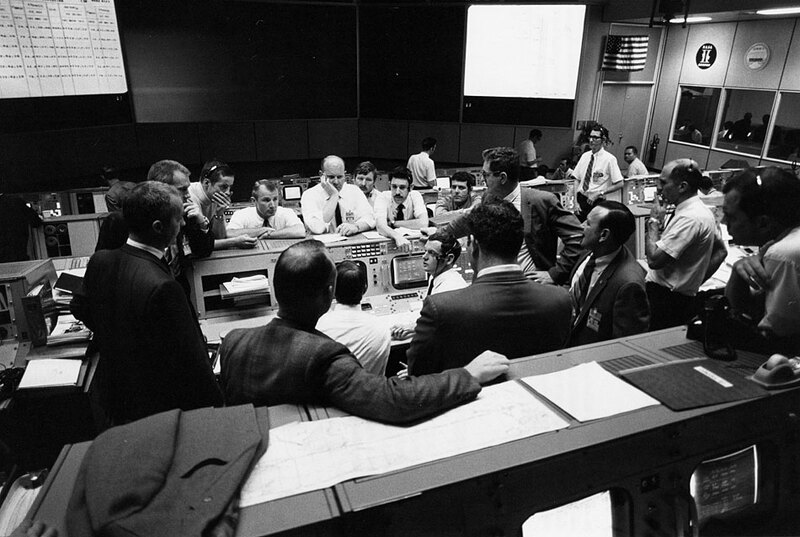 In June 1965, the Apollo Mission Operations Control Center (MOCR, pronounced “moh-ker”) was used for the first time for Gemini 4. It was located in the Manned Space Flight Center in Houston, Texas (later named Johnson Space Center in 1973). There were actually 2 MOCRs, and they controlled all of the Gemini, Apollo, Skylab, and even the Space Shuttle flights up until 1998. Each individual row of consoles was on its own tier, all overlooking 3 huge projection screens down at the front of the room. Each row consisted of flight controllers specialized in different systems for the space craft. MOCR1 was used for Apollo 7, Sklab, and Apollo-Soyuz Test Project missions, while MOCR2 was used for the Gemini and Apollo flights. MOCR2 was actually used when Apollo 11 first landed on the moon on July 20, 1969. Since 1985 this room has been a designated National Historic Landmark, and can still be visited today. It was last used in 1992 as the flight control room for a shuttle mission, and was subsequently converted back almost entirely to its Apollo-era configuration. The preserved room is pictured here on the left, with my husband and I hanging out in the FLIGHT and CAPCOM chairs. Pictured here is a shot of one of the consoles and a couple of the projection screens from the third tier. In the center projection screen you can see what the World Map projection used to look like, and the sinusoidal lines that marked vehicle orbits about the planet. On the right side of the console itself you see a couple of tubes (notice the little silver caps in the 6-cubby hole space). Flight controllers used these to pass papers (and occasionally snacks, sodas, and the rumored small animals) back and forth to the MER (Mission Evaluation Room) and their back rooms (MPSR – Multi Purpose Support Room). These tubes used a vacuum pipe system, similar to something you might see at a bank drive through, and were routed throughout the building. “This mirror flown on Aquarius, LM-7, to the moon April 11-17, 1970. Returned by a greatful Apollo 13 crew to “reflect the image” of the people in Mission Control who got us back! As many of you may know, the Apollo 13 astronauts were meant to walk on the moon, but suffered a devastating failure two days after launch when an oxygen tank exploded. The explosion crippled their vehicle and nearly cost them their lives. After four intense days, the Lunar Module made it back to Earth. This “successful failure” was made possible by the flight control team on the ground, and this mirror was placed here to memorialize the event. A movie was also made about the events of this mission, starring Tom Hanks in 1995. This movie also stemmed several famous quotes: “Houston, we have a problem” and “Failure is not an option”. Of course the real quote is, “Houston, we’ve had a problem” and flight director Gene Kranz never actually said “failure is not an option,” but it made for a darn good movie tag line! Another interesting fact: the intense scene after the accident where all of the flight controllers are jabbering back and forth at mach speed was actually slowed down for dramatic effect! If you have not seen the movie, I do recommend it highly. 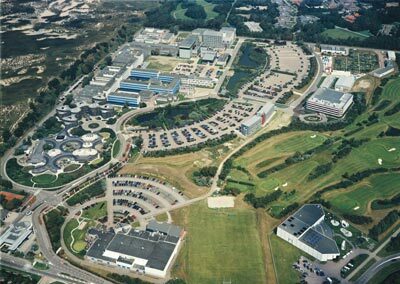 The ESTEC is situated in Noordwijk, South Holland, in the western Netherlands. I was actually pretty interested to learn this because I had no idea this was located in Holland. Being half dutch, I was excited to learn that the center of the European Space Agency’s technology development and test center for spacecraft and space technology was located in the Netherlands. ESTEC is the technical heart where most ESA projects are born and where they are guided through the various phases of development. The ESTEC develops all types of ESA missions: science, exploration, telecommmunications, human spaceflight, satellite navigation and Earth observation. It also provides the managerial and technical competences and facilities needed to initiate and manage the development of space systems and technologies. Its test center specializes in spacecraft, with supporting engineering laboratories specialised in systems engineering, components and materials, and working within a network of other facilities and laboratories. 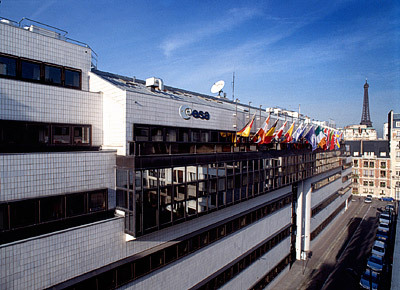 ESA’s Headquarters are located in Paris, France, and currently includes 19 member states. ESA participates in the United State’s ISS (International Space Station) program, and through that partnership has sent astronauts into space and launched resupply ships known as ATVs (Automated Transfer Vehicles. When undocked, the ATVs act as trash disposal as they burn up on re-entry into Earth’s atmosphere. ESA has launched unmanned exploration missions to other planets and the Moon, operated Earth observation, science, telecommunication as well as maintained the Arianespace spaceport, the Guiana Space Centre, at Kourou, French Guiana. ESA science missions are based at ESTEC in Noordwijk, Netherlands, Earth Observation missions at ESRIN in Frascati, Italy, ESA Mission Control (ESOC) is in Darmstadt, Germany, the European Astronaut Centre (EAC) that trains astronauts for future missions is situated in Cologne, Germany, and the European Space Astronomy Centre is located in Villanueva de la Cañada, Spain. Arianespace, located in Kourou, French Guiana, was founded in 1980 as the world’s first satellite launch company. The French space agency CNES, Astrium, and all the European space companies are all share holders. Arianespace has signed contracts with 80 customers and carried out 208 Ariane launches, launching more than half of the commercial satellites now in service worldwide, 26 Soyuz launches (2 at CSG and 24 at Baikonur via its joint subsidiary with Russia, Starsem) and the first launch of Vega. Vega is an expendable launch system in use by Arianespace jointly developed by the Italian Space Agency and the European Space Agency. The Shuttle program was run from both Kennedy Space Center (KSC) in Florida, and Johnson Space Center (JSC) in Houston, Texas. KSC takes care of the vehicle until it leaves the launch platform, while JSC takes over for the rest of the mission. When the Shuttle program began in 1981, the Apollo MOCRs in Houston became Flight Control Rooms (FCR, pronounced “ficker”). FCR1 (formerly Apollo/Gemini’s MOCR1) became the very first shuttle control room, while FCR2 (since converted back into historical MOCR2) was used mostly for classified DOD (Department of Defense) shuttle missions. Pictured here is what the FCR looked like for space shuttle mission STS-70. 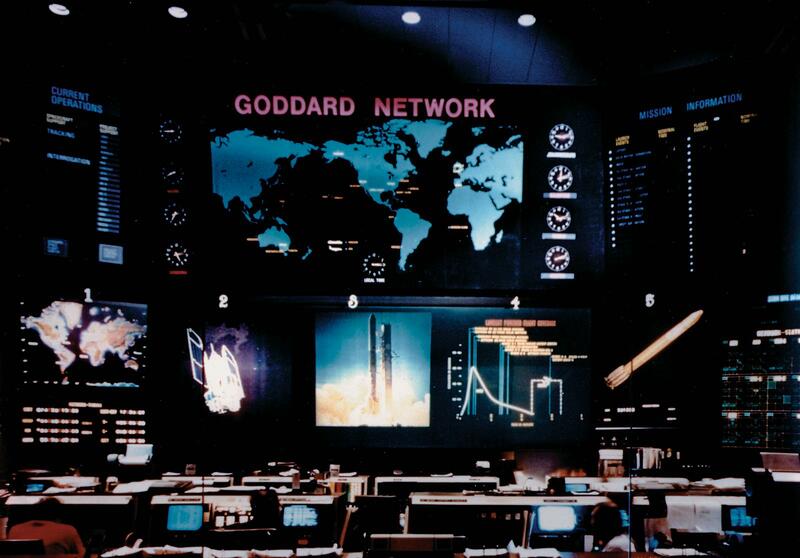 In 1992, JSC began building a new five story extension to Building 30 – the building where the JSC Mission Control rooms reside – called “30 South”. This is where the Red, White, and Blue FCRs live, and went operational in 1998. FCR2 and the White FCR were jointly used for seven shuttle missions, STS-70 through STS-76, but after STS-76 the White FCR handled all following shuttle flights through the end of the program. When it was not in use for shuttle missions, the White FCR was reconfigured as a backup for the ISS (International Space Station) FCR. The Red FCR is used for SIMS, while the Blue FCR was the ISS FCR until the fall of 2006 when the former MOCR1 was upgraded into FCR1. Pictured here is Firing Room 1 at Kennedy Space Center, Florida as it looked in 1998 in its shuttle configuration. This control room was set up with software used to simulate space shuttle flight and ground systems in the launch configuration. A team of flight controllers and engineers would work through a series of major failures and problems to prepare them for worst-case scenarios. These simulation scenarios, SIMs are still used today to train astronauts and flight controllers for potential failures, keep them current on the vehicle’s systems, and to certify new flight controllers. The Canadian Space Agency (CSA), located in Saint-Hubert Quebec, was established in March 1989. The CSA contributed the Canadarm to NASA’s Space Shuttle, as well as the Mobile Servicing System (MSS), which houses the Canadarm2 and Dextre on the International Space Station (ISS). Mission control operations for the Canadarm were handled by Houston the Canadian mission control center first became fully functional. Before the CSA, Canada contributed to the world of space exploration by launching Alouette 1 via NASA in September 1962, becoming the third country to put a man-made satellite into space. In 1972, Canada launched Anik A-1 and became the first country in the world to establish its own domestic geostationary communication satellite network. The European Astronaut Centre (EAC) was established in 1990 and is located in Cologne, Germany. EAC provides the European Space Agency (ESA) with astronaut selection, training, medical support and surveillance, as well as support of astronauts and their families during preparation for and during flight. 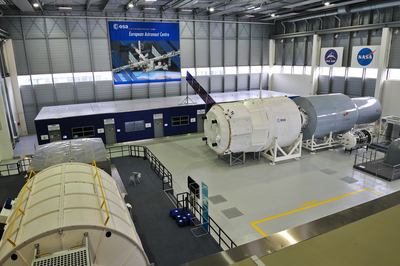 EAC is the training center for all European built hardware that flies to the ISS (International Space Station), including ESA’s Columbus laboratory systems, subsystems and payloads. The Columbus laboratory is one of the modules that is part of the International Space Station. EAC also trains for astronaut operations for the Automated Transfer Vehicle (ATV), a payload vehicle that helps resupply the ISS. The Soviet Space Program was dissolved with the fall of the Soviet Union, and Russia and the Ukraine inherited the program. Russia created the Russian Aviation and Space Agency, now known as the Russian Federal Space Agency (ROSCOSMOS), while Ukraine created the National Space Agency of Ukraine (NSAU). Roscosmos is the government agency responsible for the Russian space science program and general aerospace research, and is located in Moscow. 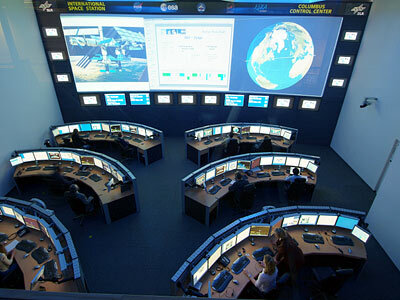 The Mission Control space flight operations center (MCC-M) is located in a nearby city of Korolev. Cosmonauts Training Centre (GCTC) is in Star City. Launch facilities used are the Baikonur Cosmodrome in Kazakhstan. Roscosmos launched the first module of the International Space Station (ISS) “Zarya” in 1998, also known as the Service Module (SM). Roscosmos also contributed Zvezda (The Functional Cargo Block, or FGB) and the Rassvet module, also known as the Mini-Research Module 1 (MRM-1). The Nauka module (Multipurpose Laboratory Module (MLM)) is the last planned component of the ISS, but has not yet launched. With the end of the space shuttle program, Roskosmos is the sole party responsible for launching astronauts and cosmonauts into space. The Russian Soyuz-TMA spacecraft launches three people at a time, and the unmanned Progress resupplies the space station. The Soyuz rocket is capable of launching about 7.5 tons into low Earth orbit (LEO), and when there is a 6-person crew on the ISS, two Soyuz remained docked at all times to act as life boats to the crew. 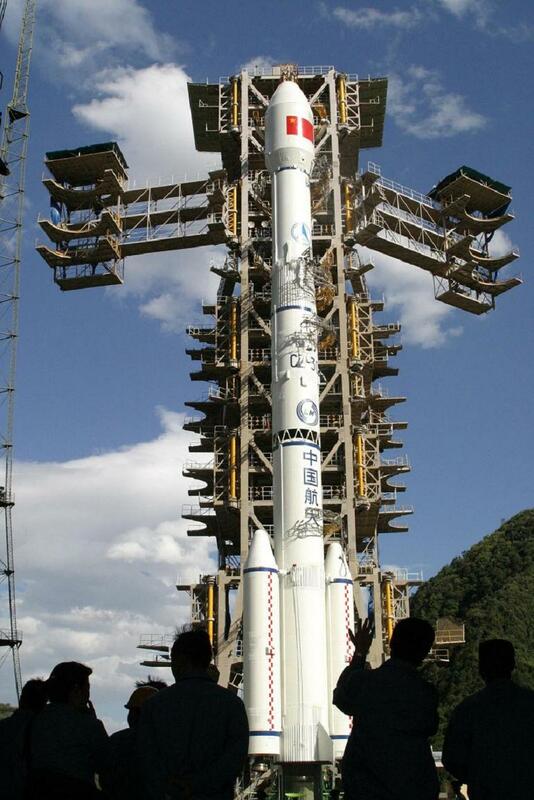 The Chinese space program is directed by the China National Space Administration (CNSA). CNSA is working to develop a permanent Chinese space station in 2020 and crewed expeditions to the Moon and Mars. China has already sent satellites to orbit the moon. 2024 is the proposed date of China’s first moonwalk. The first uncrewed Mars exploration program could take place between 2014–2033, followed by a crewed phase in 2040-2060. The first Chinese crewed flight was Yang Liwei’s successful 2003 flight aboard Shenzhou 5. Yang was in orbit for 21 hours, making China the third country to independently send humans into space. The Shenzhou program had four uncrewed test flights and two crewed missions, the first of which was Shenzhou 1 on November 20th, 1999. Shenzhou 7 was China’s first spacewalk mission. On September 29th, 2011, China launched Tiangong 1, the first step to testing the technology required for a planned space station, and China made 2 unmanned docking missions with the module in October of 2011. The Shenzhou 9 craft docked on the 18th of June, 2012 with Tiangong1, marking China’s first manned spacecraft docking. A second space lab, Tiangong 2, will be launched in 2013 after the first one is deorbited. The Chinese space station is scheduled to be completed in 2020, just as the International Space Station (ISS) is scheduled to retire. Technically, the Shenzhou spacecraft can dock with the ISS, as its docking mechanisms were designed after Russian ones, but I am unaware of any plans for such a mission. The International Space Station (ISS) FCR is located in Building 30 at Johnson Space Center. The first ISS control room, originally named the Special Vehicles Operations Room (SVO), was called the “Blue FCR,” and was operational 24-7 to support the ISS. In the fall of 2006, the ISS FCR moved to FCR1 (formerly the Apollo MOCR1). It had its original consoles and tiers removed after shuttle mission STS-71 in 1995, and had originally been converted to a “Life Sciences Center” for ISS payload control operations. It was substantially remodeled with all the latest greatest stuff for the ISS flight controllers, and has the newest technology for the Houston control centers. 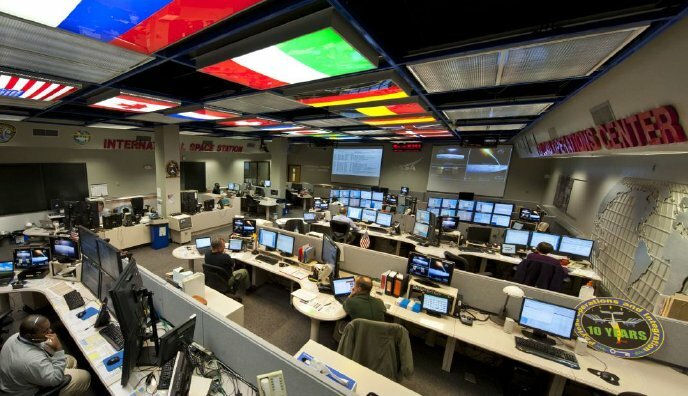 The orange display panels you see in the picture to the left are called “DVIS” (Digital Voice Intercommunication Subsystem – pronounced Dee-Viss) keysets, and are what the flight controllers use to talk to each other, the crew, and to other control centers. 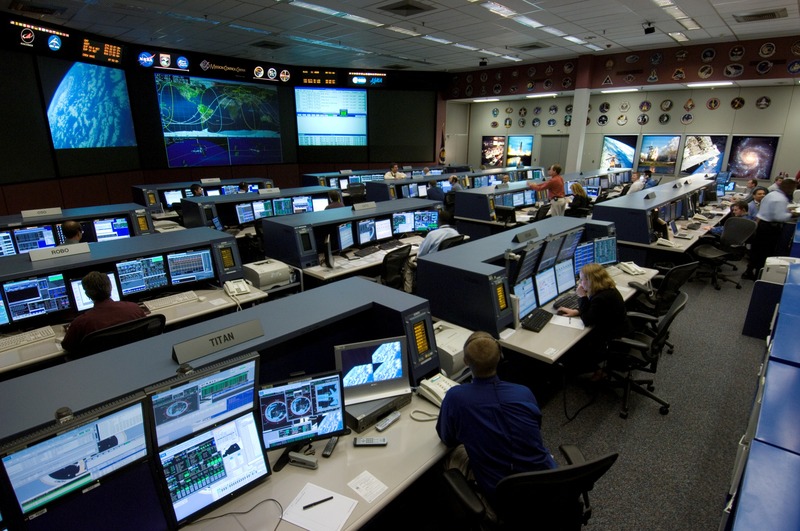 The keysets are part of a massive, custom built intercom system that connects everyone on console with the people supporting mission, both at JSC and at other control centers, including overseas. Each keyset has a touch sensitive plasma display with three columns and eight rows of buttons for a total of 24 “loops” that a flight controller can monitor all at one time. There are ten pages which can be customized for different missions, which is a significant improvement from the Apollo era keysets that were hard coded to limited comm paths. Flight controllers can also control volume and change pages and reconfigure individual loops. Today, the DVIS keyset panels have been upgraded to what you see in this photo of the ISS Flight Director’s console (the light blue panels next to Flight Director Chris Edelen’s head). The new keysets feature the latest digital communication technologies, such as Voice-over-IP and user friendly interfaces that let you do things like control individual loop volume. Notice we also have fancy new light-up console placards on each of our consoles (the blue glowing things that say FLIGHT DIRECTOR, CAPCOM, ETHOS, etc). The person sitting at the right-center of the photo (you can just see the top of his head) is at the PLUTO console, which is where I sit when I’m in the FCR. I described what the PLUTO console does a bit in my previous post about the ISS. Yes, that was a shameless plug. The Payload Operations Center (POC – pronounced “pock”) is located at NASA’s Marshall Space Flight Center (MSFC) in Huntsville, Alabama. 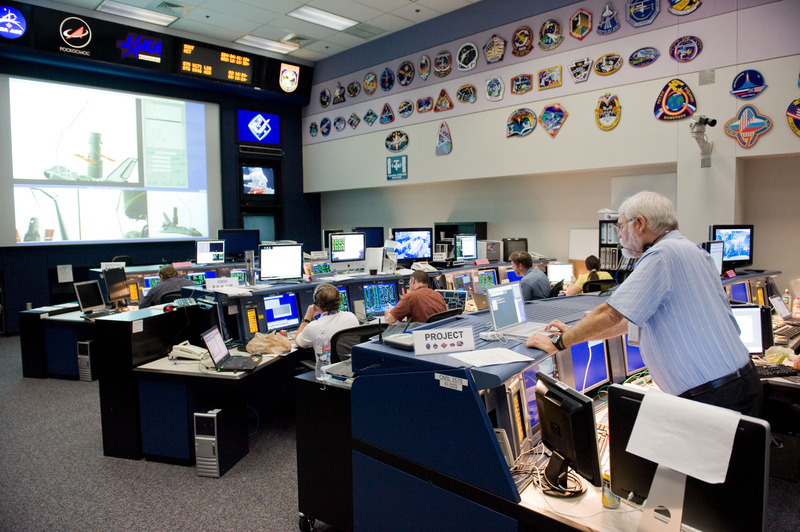 The POC helps plan payload science missions and talks directly to the ISS crew via “PAYCOM”, a console position similar to CAPCOM at Mission Control in Houston, Texas. The POC integrates research requirements between the scientists on the ground and the experiments and astronauts on the ISS. It coordinates research schedules across Canada, Europe and Japan, as well as remote telescience workstations in the United States. It also monitors the health and status of scientific instruments deployed on the space station. Space Exploration Technologies Corporation, or SpaceX, is a space transport company in Hawthorne, California founded in 2002. SpaceX developed the Falcon 1 and Falcon 9 launch vehicles and the Dragon spacecraft, which is lifted into orbit by the Falcon 9 launch vehicle. Dragon is currently a cargo only vehicle, but is later planned to carry humans as early as 2015. In December 2010,SpaceX became the first privately funded company to successfully launch, orbit and recover a spacecraft with the launch of the COTS Demo Flight 1 mission. SpaceX also became the world’s first privately held company to send a cargo payload to the International Space Station (ISS) on the 25th of May 2012. In 2006, NASA awarded the company a Commercial Orbital Transportation Services (COTS) contract to design and demonstrate a launch system to resupply cargo to the International Space Station (ISS), though SpaceX designs, tests and fabricates the majority of its components in-house. SpaceX has also signed contracts with private sector companies, non-American government agencies, and the American military for its launch services. SpaceX is in the design stages of the “Falcon Heavy” launch system, which will be the most powerful rocket in the American inventory since the Apollo-era Saturn V, and can be used to send a Dragon spacecraft on lunar orbiting missions, or send a modified unpiloted Dragon on a Mars landing mission. 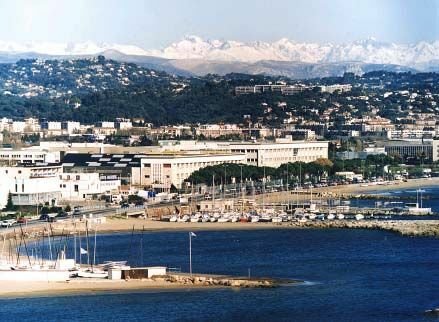 Located in Cannes France, Thales Alenia Space was established on June 1, 2005 by the merger of Alcatel Space and Alenia Spazio. This company has built modules for the International Space Station (ISS), notably the Multi-Purpose Logistics Modules (MPLMs) that flew as cargo holders inside shuttle, and the Columbus module that is owned by the European Space Agency, ESA. They also helped with the design, development, integration and testing of Node 2 & Node 3 ISS modules, and the Cupola – the astronaut’s window on the bottom of Node 3 that looks down over the Earth. Thales Alenia Space has also become a player on the NASA programs “Commercial Orbital Transportation Services” (COTS) and “Commercial Resupply Services” (CRS), the latter aimed to deliver cargo to the ISS comercially. In June of 2009, Thales Alenia Space entered in Contract with Orbital Space Science for the supply of nine Pressurized Cargo Modules for the Cygnus vehicle, one of which will be utilized in the COTS demonstration mission. This is by no means the full compliment of projects this company has completed, so stop by their website to check them out. The photo here is from the wikipedia article on the subject since I couldn’t find a better one of their facility on their actual website. The Columbus Control Centre (Col-CC) is located at the German Aerospace Center (DLR) facility in Oberpfaffenhofen (don’t ask me how to pronounce that!) near Munich, Germany. Col-CC is the Mission Control Center which is used to control the Columbus research laboratory, which was attached to the International Space Station (ISS) on February 11th, 2008. The control center is referred to as “Munich” when the astronauts call down from orbit, like JSC is referred to as Houston (probably because it’s easier to pronounce). The center is operated by the DLR, under contract from the European Space Agency (ESA) and EADS Astrium. Col-CC went into operation during the STS-122 Shuttle Mission, which delivered the Columbus module to the ISS. Col-CC actually has two control rooms: one for real-time operations, and one for preparation activities, such as the training of controllers, simulations, etc. The second control room also acts as a backup for the first control room. There is also a backup control center on site at DLR Oberpfaffenhofen, but not located in the same building. 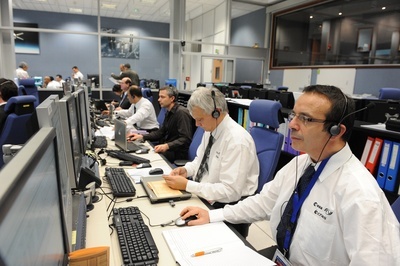 The ATV Control Center in Toulouse, France receives communications services from Col-CC. The ATV Control Centre (ATV-CC) located at the Toulouse Space Centre (CST) in Toulouse, France. The center is responsible for planning and executing of the ATV (Automated Transfer Vehicle) from launch to re-entry. ATV-CC works with the Columbus Control Center (Col-CC) in Oberpfaffenhofen, Germany, which provides ATV-CC with access to both the American TDRSS satellite network, and the European Artemis communication networks so it communicate with ATV and the International Space Station (ISS). ATV-CC coordinates not only with NASA’s Mission Control Center in Houston, but also with the Russian FKA Mission Control Center in Moscow, Russia as well as the ATV launch site at the Guiana Space Centre in Kourou, French Guiana. The ATV itself is an unmanned resupply spacecraft developed by ESA that burns up on re-entry into the Earth’s atmosphere. It has three times the payload capacity of Russia’s supply vehicle Progress, and helps resupply the International Space Station (ISS) with propellant, water, air, payloads and experiments. They also are utilized to reboost the ISS into a higher orbit. Since 2008, there have been 3 ATV launches: Jules Verne, Johannes Kepler and Edoardo Amaldi. The ATV program is planned to end after the fifth ATV is launched in 2014, but may be adapted into a 3-man crew vehicle to launch astronauts into space in the near future.